Many countries would extend moral and, at times, material support to India, but may not go beyond that. Beyond the euphoria over forcing Pakistan to release IAF pilot Wing Commander Abhinandan Varthaman, India must accept the hard reality that it is all alone in the subcontinent in its fight against terrorism emanating from the Pakistani soil. Many countries would extend moral and, at times, material support to India, but may not go beyond that because of geo-political compulsions and their national strategic agenda. Can India bank on US? The events that unfolded in the last one week following the terror attack in Pulwama clearly show that the US and several western capitals are fully aware of Pakistan’s sponsorship of terrorism. That Pakistan is debt-ridden, is considered an epicentre of terrorism and is ever-available as a mercenary jihadi supplier is no longer a perception but an abject reality. Yet, the White House would have to put up with Islamabad because of Pakistan’s geographical importance as a non-Nato ally in the US’ war against terrorism. The US wants Pakistan to take action against the Haqqani network and not allow its territory to be used as a re-grouping facility for the Afghan Taliban even as it is pushing for an end to the 17-year Afghan war. Given the circumstances, the US cannot fully disassociate with Pakistan, although it may not hesitate in supporting New Delhi by sharing intelligence inputs and backing it in its efforts at dismantling terror launchpads in Pakistan. While it is impossible for China to replace the US in providing financial bailout package to Islamabad, Pakistan is an important asset for Beijing in its economic engagement with Africa and the Middle East. Besides reducing the cost of transport, the Gwadar port is of immense strategic importance to China as an entry point to the Indian Ocean and help it control the choke points in the sea lanes. Pakistan, on its part, will continue to use its so-called non-state actors against India as a major diversionary strategy. It will be a source of irritation and embarrassment for New Delhi by allowing the China-Pakistan Economic Corridor (CPEC) to pass through PoK. India, therefore, has to be ready to fight it out on its own. It has to be prepared for a conventional war and also fight the perception battle through social media and diplomatic channels. More than a real-time war theatre, this is a war of nerves and New Delhi has to effectively counter it and win it. As against the robust democratic institution-based political system in India, the intense political-social contradictions in Pakistan have allowed its army to have a total and decisive role in governance, foreign policy and day-to-day administration. The Pakistan army, smarting under a humiliating defeat, is now likely to tighten the screws on Imran Khan, telling him to either fall in line or unseating him as a scapegoat, sooner or later. 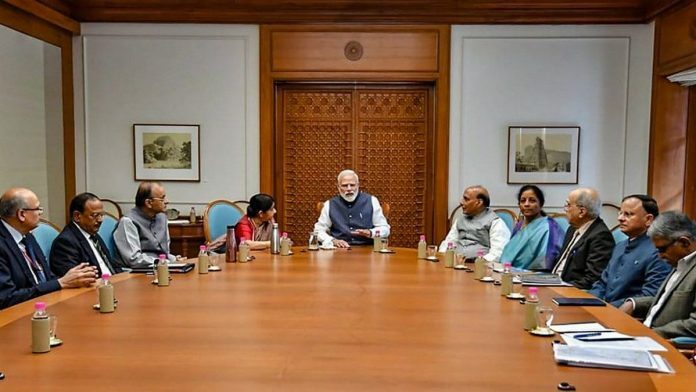 It was not only necessary for India to avenge the terror attack in Pulwama, but send a strong message to ‘Naya Pakistan’ that it was dealing with a ‘new’ India under a strong leader, Narendra Modi. The political dispensation in Islamabad and the Pakistani Generals may have many reasons to hate Modi, but they will have to admit that the first round of this war of nerves went in favour of Modi. Why Editor Used Old PIC , we know Sushma Swaraj is not in iNDIA . Instead of getting into a thousand years’ war frame of mind, we may wish to revive SAARC, move the subcontinent’s focus to development and cooperation. Also try to bring more harmony to the Valley.